Saturday, January 21, 2017 at 3:00 p.m.
Monday, January 23, 2017 at 8:30 p.m.
On January 20, 2017, Pascal Simon reported in Ouest-France that Leonie Martin, the sister of Saint Therese of Lisieux, may be the next native of Normandy to be proclaimed a saint by the Catholic Church. Leonie's process of beatification opened in 2015. It reaches a new stage on Saturday, January 21, 2017 at the monastery of the Visitation in Caen, where Leonie lived as Sister Francoise-Therese from 1899 until her death. Her body, which has lain in a tomb in the crypt of the monastery since she died in 1941, will be transferred to a new tomb in the chapel where she professed her vows in 1900. 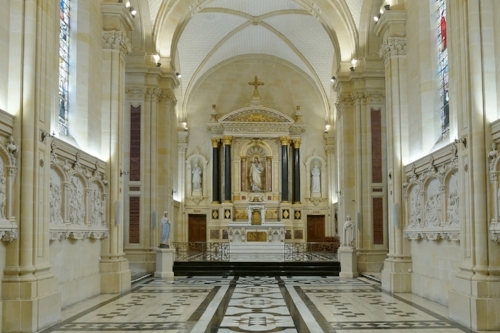 Her new shrine was designed by architect Hervé Declomesnil. Monseigneur Jean-Claude Boulanger, the bishop of the diocese of Bayeux and Lisieux, will preside at a Mass to mark the occasion at 3:00 p.m. He will be assisted by Father Antonio Sangalli, an Italian Carmelite priest who is the postulator of Leonie's cause. Father Sangalli served as vice-postulator for the cause of Leonie's parents, Saints Louis and Zelie Martin. Father Sangalli told Ouest-France that the diocesan inquiry into whether Leonie practiced "heroic virtue" is still going on. In an interview with TendanceOuest, Father Sangalli said that Leonie's life was full of the spirit of the gospel, of the beatitudes, and that her sanctity was the "heroicity of the everyday." He hopes that this first stage will be completed before the end of "Leonie's year," which opened on the 75th anniversary of her death (June 16, 2016). The file will then be sent to the Vatican, which might proclaim Leonie "Venerable" (a title given to candidates for sainthood who are deemed by the Church to have practiced heroic virtue). If that were to happen, the next step toward Leonie's beatification would be to identify a miracle attributed to Leonie's intercession, that is, a healing that cannot be explained by science. Father Sangalli said that three possible cases of unexplained cures have been identified: a little boy in Brazil, a little girl in Switzerland, and a little girl in France. We congratulate Monseigneur Boulanger, Father Sangalli, and the nuns of the Visitation on this happy occasion. How they have labored and prayed to make the holiness of Leonie's life known so that it may inspire us! Let's continue to support Leonie's cause with our prayers. For details in French, see "Leonie Martin, future sainte? Nouvelle etape a Caen" by Pascal Simon for Ouest-France, January 20, 2017 and "A Caen: les Les travaux avancent pour la beatification de Leonie Martin," by Marc Eynaud for Tendance-Ouest.